After all is said and done, your wedding film will be one of the only things you have left to remember your day by! There are so many moments that happen in between, and a wedding film has the power to capture them in depth. You will be able to relive the day, your vows, and the speeches as if you were there all over again. Our wedding film services range from rehearsal dinner coverage all the way to full feature films. We have curated custom collections to best serve you and your desires for your day so you are sure to get exactly what you want. You've waited so long for this day to come. You want everything to be perfect. The Venue has been selected, you've pieced together your perfect wedding team and you now want to find a videographer that you connect with. Someone whose vision and philosophy align with yours. You are wondering if they will be able to work alongside the photographer you spent months choosing or if they will make you feel uncomfortable in front of the camera. You are looking for someone who makes wedding films that connect with you... ones that don't feel cheesy or staged. The moments at your wedding are to important to gamble on and you know you've only got one chance to make the right choice. We know how important this day is to you. We know that it's packed full of emotions, friends and family. We know you don't want to miss anything and that you want someone to turn it all into a work of art so you can revisit it 70 years from now. Moments matter to us. Every wedding film we make is a small collections of meaningful moments between loved ones that as a whole create something beautiful. We never want to make you or your guest feel uncomfortable and we go through great length to do this, from the gear we choose, the clothes we wear and our shooting tactics throughout the day. When you and your guest are comfortable with us you're being yourself, and that is exactly what we want to document. 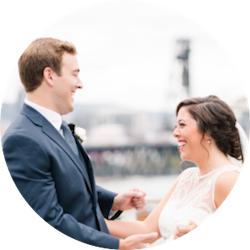 We want to capture that smile that everyone knows you have, or the tender words passed just after the first look, or the endearing hug between your Father and groom when he hands you off for the last time. These are the moments we will capture when you entrust your day, family and memories to us. Our highlight films are a beautiful classic cinematic edit that aim to give an emotionally true recollection of the day. These films are non-linear and weave together all the different events and moments. They vary in length depending on the amount of customizable coverage you choose. To view more examples, visit our Home Page and Portfolio for highlight film examples. Some of the most beautiful and heart felt words are said during speeches. This film is a chronological edit of the speeches at your wedding. If you would like to relive your entire day, the feature film is for you. This film is chronologically edited and includes all the major events throughout your day. This film ranges in length from 30-120 minutes as a general rule. A beautifully crafted short trailer of your wedding day. This film is roughly 1 minute in length and delivered 7 days after your wedding. Great for getting up on social media to share with friends and famliy. A wide aerial perspective can really help anchor where you chose to have your wedding and show it in a beautiful way. This footage is sprinkled into the Highlight and Feature Film if purchased. I always tell my couples that the best speeches at your wedding are the ones that happen the day before. This film is a chronological edit of the rehearsal dinner speeches.